For the salad dressing, add cranberry sauce, shallot, orange juice, vinegar and dijon in a food processor and pulse until smooth. With the motor running, gradually add olive oil and blend until emulsified. Season with salt and pepper. Add kale to a large salad bowl and pour vinaigrette over kale. You may end up with extra vinaigrette; if so simply reserve for another use. Massage kale leaves gently with hands or tongs to evenly distribute vinaigrette and soften kale. Add remaining salad ingredients and toss together just before serving. Peel tangerines, pull each slice apart and put them on the bottom of plate, underneath the banana as the island or sun. Before you being making the ice cream, zest, juice and then dice the tangerines (see measurements in the ingredient list). Set aside. In a medium-sized mixing bowl, use an electric mixer or a whisk, to whip the egg yolks with the sugar. Mix until it's very thick and is pale yellow. When you drizzle it, it should rest for a moment before sinking into the rest of the mixture -- this is called the "ribbon stage." This will likely take several minutes. Pour the milk into a small saucepan and scald it over medium heat. Tiny bubbles will appear on the edges of the pot and it should be very hot, but not boiling. Remove it from the heat to cool a bit. Very gradually pour about 1/4 of the slightly cooled milk into the egg-sugar mixture, and blend with a whisk until it's evenly combined. Repeat this one more time. Then pour all of this back into the saucepan with the remaining milk. Over medium-low heat, stirring almost constantly with a wooden spoon, cook until it becomes a beautiful, thick custard, about 6 minutes. It's done when it coats the back of the spoon. (Be very careful not to overcook this -- once you notice it becoming thicker, it's nearly there. If you leave it too long it will curdle.) When it's done, remove it from the heat immediately and let it cool for 15 minutes or so. Now, in a medium-sized mixing bowl, whisk the zest, juice, Mascarpone and vanilla together. Then slowly whisk this mixture into the custard. Let this cool, stirring from time to time, for about 2 hours. Pour into an airtight container and place in the refrigerator for at least 4 hours and ideally overnight. Freeze according to your ice cream machine's directions. Stir in the diced tangerine and mini chocolate chips. For a soft ice cream, you can serve it at this point. Or you can freeze it until you're ready -- it should become firm within about 6 hours. Using the toaster or a preheated oven, toast the four English muffin halves until crunchy. Meanwhile, mash the raspberries with a fork in a small bowl. Bring cream cheese to room temperature. Add cream cheese to the bowl of raspberries and mix until spread becomes consistent. Evenly spread the raspberry cream cheese over the four halves. Distribute the strawberries and blueberries over the spread, and sprinkle on the coconut if desired. Whisk oil, vinegar, shallot, salt and pepper in a large bowl. Let stand for 5 to 10 minutes to allow shallots to soften and mellow a bit. Place chicken in a resealable plastic bag set in a shallow dish. For marinade, in a small bowl, combine 3 tablespoons of the lemon juice, the lime juice, ¼ teaspoon of the salt, the crushed red pepper and the ¼ teaspoon black pepper. Pour marinade over chicken. Seal bag; turn to coat chicken. Marinate in the refrigerator 15 minutes. Meanwhile, place kale in an extra-large bowl. Drizzle with oil. Using clean hands, massage oil into kale; set aside. Halve, seed, peel and chop mango, reserving the juice. Set chopped mango aside. For dressing, in a small bowl, combine the reserved mango juice, the reserved lemon peel, the remaining 3 tablespoons lemon juice, the remaining ¼ teaspoon salt, the ginger and the ⅛ teaspoon black pepper. Set aside. Drain chicken, discarding marinade. Heat a grill pan over medium-high heat. Add chicken. Cook 8 to 10 minutes or until chicken is no longer pink (165°F), turning once halfway through cooking. If chicken browns too quickly, reduce heat to medium. 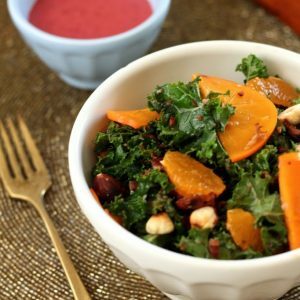 Add chopped mango, blueberries and hazelnuts to kale in bowl. Drizzle with dressing; toss gently to coat. Divide kale mixture among four dinner plates. Slice chicken; arrange on top of kale mixture. To puree fresh pumpkin: Preheat oven to 325 degrees F. Cut the pumpkin in half and remove seeds and pulp. The seeds are delicious when roasted so set them aside! Cover each half with foil. Bake face down in the oven for 1 hour or until tender. Cool and place in blender to puree. Strain to remove any stringy pieces. Place all ingredients into a blender and blend on high. Serve immediately & enjoy! Your Super Healthy Hero needs to maintain their energy and focus throughout their busy school year. Studies have shown that kids that eat nutritious foods throughout their day have longer attention spans are able to focus more during the school day. *We love the evening lunch preparation as it eliminates the morning stress of getting everyone out the door and to school on time. *A bento box is an excellent way to eliminate unnecessary waste, keep foods separate, and also to see if you have the proper proteins, veggies, fruits, and whole grains for a healthy lunch. *Have your child practice their knife skills by chopping the vegetables and fruits. *Leftovers from dinner are a great way to break up the lunch menu so keep a thermos handy to pre-warm up last night’s dinner and pop it in the lunch box. *Skewers and toothpicks are excellent for making fruit kabobs. You can also use turkey, cheese, cucumbers, and tomatoes for fun and healthy skewers. Studies have shown that many kids like to fill up their summertime with sedentary activities, such as video games or television. Limiting screen time to less than 2 hours per day is recommended as well as 60 minutes of physical activity per day. This includes adults too! It can be difficult to motivate the kids to get off the couch and out the door so we have a few fun ideas to get everyone moving. Invite friends over. This is a great way to get their creative juices flowing to see what physical activities they can create. They might play a game of baseball in the backyard, create a dance together, or run through the sprinklers. Keep it fun. Kids will not be super excited to go for a 15-minute jog around the block but if you challenge them to race you to landmarks along the way, you will most likely both end up having fun while getting your heart rates up. Hula hoops, balls, & jump ropes. Keep toys handy to keep kids entertained and physically fit. Enjoy nature. Playgrounds are great but spending time in nature climbing trees, building forts, and exploring offer a restorative way to stay active. Stay active indoors. If the weather isn’t cooperating and outdoor time is limited, pull out the game of Twister and have a handstand contest to stay active. Family Time. Staying active as a family is a great way to model healthy routines. After dinner, take the dog for a walk, go for a bike ride, or shoot baskets together as a family. Try something new. 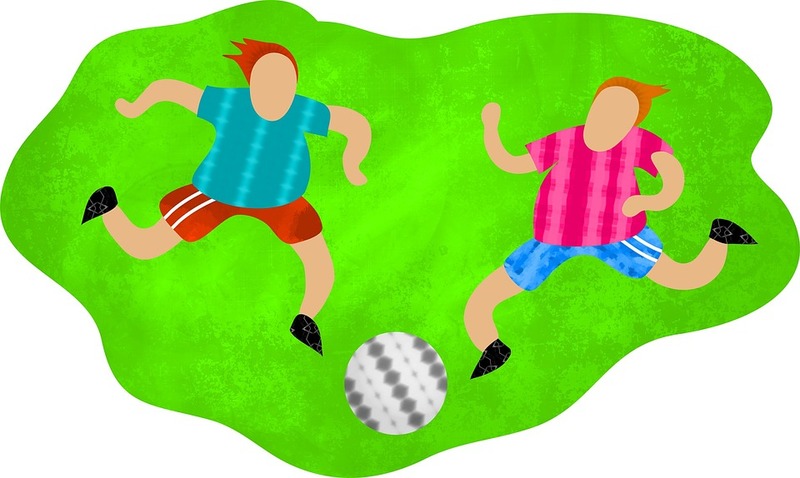 Summer is a great time to try a new sport or activity. Sailing lessons, stand up paddleboarding or rollerblading are great exercises for all ages!